NIZAM’S INSTITUTE OF MEDICAL SCIENCES (NIMS), Hyderabad has posted an advertisement for recruitment of doctors for posts of Professors, Associate Professors, Assistant Professors, Lecturers and Medical Officers in various departments. 4) Lecturers: Radiation Oncology, Hospital Administration, Cardiology, Medical Gastroenterology, Surgical Oncology, Vascular Surgery, Endocrinology, Anaesthesiology & Critical Care, Respiratory Medicine . 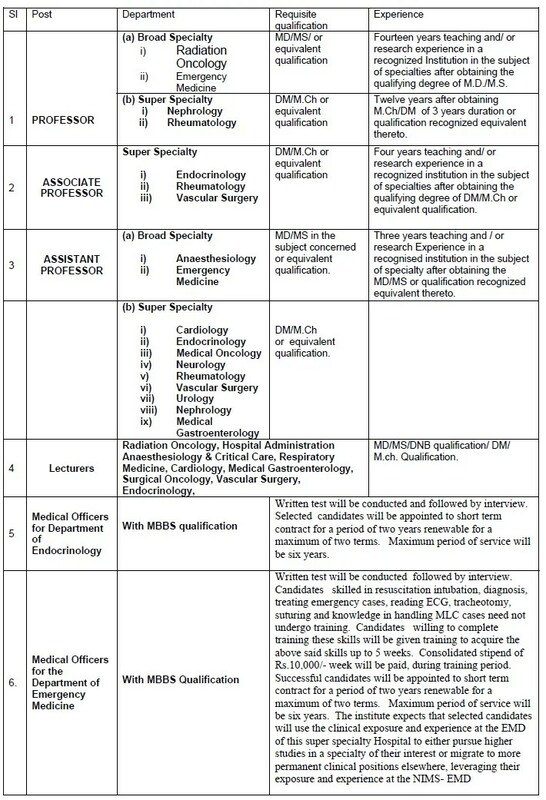 5) Medical Officers for Departments of Endocrinology and Emergency Medicine : With MBBS qualification. D) i) Lecturers in Broad Specialty MD/MS Rs.18750/- + Grade Pay Rs.6600/- plus Allowances per month. ii) Lecturers in Super Specialty with DM/M.Ch qualification is Rs.21900- + Grade Pay Rs.7600/- plus allowances per month. Important Dates: Last date of application is 07-06-2014. Written test and interview for Medical Officers of Departments of Endocrinology and Emergency Medicine will be on 12-06-2014 from 9 am to 4 p.m.